Mess rooms, crew cabins, corridors and stair cases... Gerflor proposes a complete flooring solution (from floor to wall) dedicated to ship interiors. 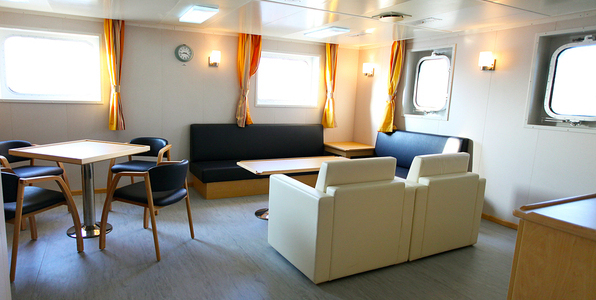 All STREAMO homogeneous floorings complying with IMO regulations are adapted in these areas. A wide choice of color and different directional and non-directional designs will bring a good look in corridors, crew cabins, crew restaurants, and crew gym. Our different surface treatments, such as the patented lifetime wax-free treatment EVERCARE, offer an unmatched ease of maintenance and a strong traffic resistance. The flooring offer is completed by an extended choice of interior finishes (skirting, handrails, …).